A while back, I posted a few thoughts about the video game Star Wars: The Old Republic, which included a reflection on how the video game genre has the possibility to get people to think through ethical and moral decisions that they might not otherwise have to face. My thoughts today are much less theoretical, and much more concerned with the game mechanics--I want to talk about what I see to be a major weakness of the end-game raid content. Now, in raids, there are certain things that you fight that are called "bosses"--that is, robots, creatures, or bad guys that you fight one (or two) at a time and that are even more challenging than the rest of the raid encounter. When killed, these bosses reward better loot, too--the weapons are more powerful, for example, or the armor is rarer (like my super-sweet hat). One of the things that makes boss encounters more challenging is that the bosses usually have special skills that make them more dangerous--they have the ability to disappear and then reappear elsewhere, for example, or freeze everyone in a certain area in place. Learning these different mechanics of the fight is one of the most interesting parts of new raid encounters, and also one of the most satisfying things when you finally figure out how to do things smoothly and without anyone of your raid group getting killed. And there are a number of fights, including the fight against the Fabricator in Karagga's Palace, that have players solving puzzles in addition to dealing out damage, which is a welcome addition to the MMO genre. But one thing that frustrates me about all these fights is that all of the bosses have an enrage timer--that is, after a set period of time has elapsed (it depends on the fight, but often around 5 minutes), the boss becomes exponentially harder and starts killing everyone around him in one blow. This enrage timer ensures that raid groups are balanced--that they're not just comprised of players who heal other players, but that they have players whose role is to do damage, too. It also makes sure that everyone in the raid is truly playing at an advanced level, since raid groups with low performers won't put out the required damage in time. I think, though, that it also shows a lack of creativity on the developers' part. 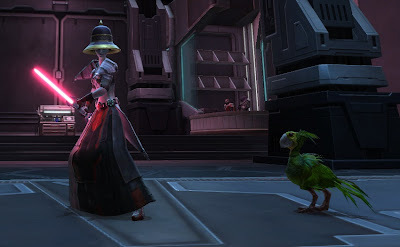 There are plenty of ways to ensure that raid groups are balanced without putting in an enrage timer--requiring specific skills that only certain classes of characters have, for example, is one way to do this. The Council fight in Eternity Vault is a a great example of a fight that checks to make sure each player is sufficiently advanced--in this fight each raid member has to fight a mob on his or her own, without any help at all from other raid members. This means that each member has to pull his or her own weight in the raid, and can't just coast along, relying on the rest of the raid to get things done. It's a really clever idea--and believe me, one that made me more than a bit nervous when I first encountered it! Now, this might seem a bit like sour grapes--perhaps my raid group can't get past a certain boss' enrage timer, and so that's why I'm writing this. But I really don't think that's it. (For starters, in the current boss that we're struggling with, we're not even making it to the enrage timer, so there's that.) Rather, it bothers me because it smacks of laziness, of a lack of creativity. It's as if the developers said, "Well, we don't want to take the time to think of a clever way to make this harder, so we'll just do the easy thing: the enrage timer!" And because it's such a generic way to make things difficult, it means that players don't learn their skills and their compatriots' skills well, either. Instead of being faced with a new mechanic that requires an unusual solution, it's just business as usual. And that lack of creativity--now that's something to get enraged about!